Speaker of the House Nancy Pelosi came out swinging against the CIA today in the dispute about briefings to her in 2002-2003 on the waterboarding of detainees. “The CIA should release the briefs,” she said. “The only mention of waterboarding in the briefing was that it was not being employed,” she told reporters, reading from a prepared statement — twice for emphasis. The Speaker said she was not properly informed of the waterboarding before it occurred and that the agency lied to Congress…..
Pelosi again called for a “Truth Commission” on torture to get all the facts on the table…..
“We were told specifically that waterboarding was not being used,” Pelosi said. “Subsequently other memebers were informed. But I did not get that briefing,” she said. Sammon said the CIA keeps meticulous records on all their briefings inside and outside the Agency. “She has opened up a box she doesn’t want opened,” by accusing the CIA of lying, said Pete Seat, a former Bush White House spokesman. “The CIA takes great offense that the Speaker of the House would accuse them of lying,” she said. President Obama has decided not to release photos which the Pentagon had planned to released by May 28 in response to a Freedom of Information Act lawsuit filed by the American Civil Liberties Union. The ACLU had asked by the photos to be released under the Freedom of Information Act and a court ordered the release. This was a decision predicted by some including Bill Kristol, editor of the Weekly Standard, Tuesday on the Fox News Channel. Obama’s decision may well cause him some problems. The president released several memos about CIA enhanced interrogation techniques which has caused considerable criticism from the right. Now the right will applaud the president’s move not to release these photos but this will call into question why he initially released the memos and decided to release the photos. Critics will say the memos were released for political reasons…. President Obama has asked the White House counsel’s office to argue against the immediate release of photographs that depict American military personnel abusing captives in Iraq and Afghanistan, an administration official said Wednesday. The president’s decision marks a sharp reversal from a decision made last month by the Pentagon, which reached a deal with the American Civil Liberties Union to release photographs showing incidents at Abu Gharib and a half-dozen other prisons. Mr. Obama advised his top military commanders about his decision in a meeting on Tuesday at the White House. Several military officials had argued against the immediate release of the photographs, saying such action could harm American troops in the field. The Obama government then told California it would not get its stimulus money if the union workers didn’t get all their pay: the stimulus forbids such action against unions, the stimulus law says. “But who wrote the stimulus?” Issa asks. “The stimulus was written in the dark of night by the unions in Washington DC,” Issa said, with instructions from Nancy Pelosi and other key Democrat lawmakers. Then the Obama rammed the stimulus through Congress to a vote. No lawmakers admitted to reading the legislation which authorized the stimulus — the biggest single pay out of federal money in one bill ever. 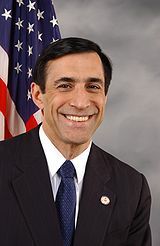 Issa said the unions see the growth of government in Washington and California as good for the unions. The federal government is due to grow by tens of thousands of people this year with 20,000 Pentagon contract oversight people and more than 70,000 census takers topping the list. The government of California is also growing. Last year, the only major segments of the California economy to grow the were government workforce and health care…. You are currently browsing the archives for the John E. Carey category.